And THANK YOU to EVERYONE Who Served Our Town by Running for Office! Unofficial polling results for the Milford Town Election from the Town Clerk’s office show that 2,266 votes were cast, which is 13% of Milford’s total registered voters. Mike Walsh will retain his seat on the Board of Selectmen. James Ligor will also retain his seat on the School Committee. He will be joined by John Erickson. Margaret Myatt and Stephanie Abisla will take seats on the Library Board of Trustees. All incumbent constables will retain their positions. Scott Vecchiolla retained his seat on the Vernon Grove Board of Trustees; Kristen Gardner will join him on that board. Congratulations to all the winners, and THANK YOU to everyone who threw their hats in the ring! We truly appreciate your service to our Town! Read the complete unofficial results here. The Milford Town Meeting Study and Improvement Committee sponsored Pre-Town Meeting Forum will be held on Wednesday, May 15, 2019 at 7:00 p.m. in the Upper Town Hall. The Forum is open to the public. 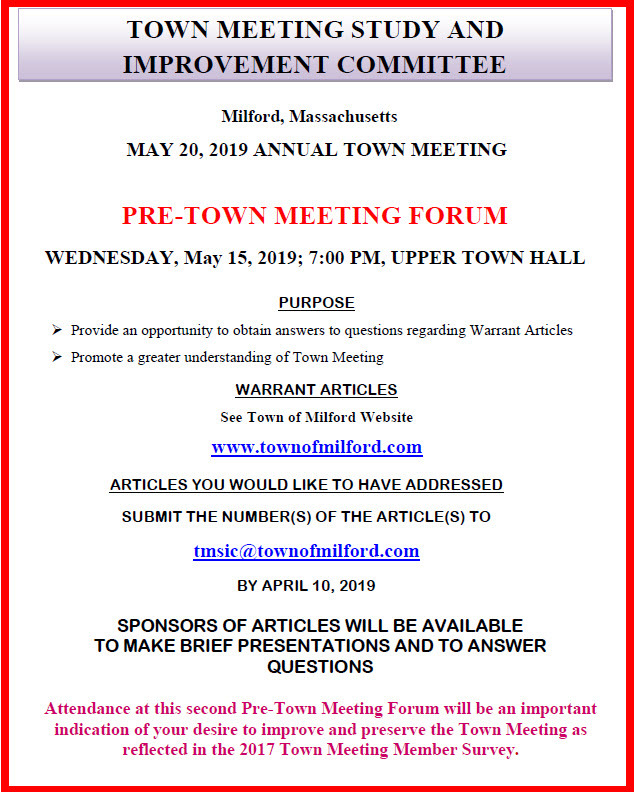 The purpose of the Pre-Town Meeting Forum is to provide an opportunity for Town Meeting members, as well as members of the public, to obtain answers to questions they may have regarding some of the articles contained in the May 20, 2019 Annual Town Meeting Warrant. 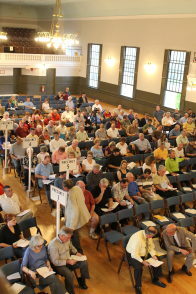 Town Meeting members and the public are requested to indicate what articles they would like to have addressed. Articles with the highest number of responses will receive special emphasis for discussion. To submit a request for a particular article(s) that you would like to see addressed, please send an email to tmsic@townofmilford.com by April 17th. In the subject line please write “Pre-Town Meeting Forum,” and in the body of the email indicate the article number(s). NOTE: The deadline for sending articles to be discussed at the meeting has been extended to April 17. 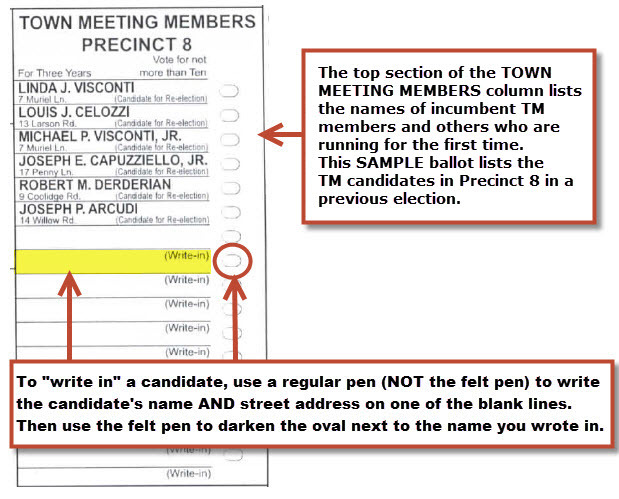 For those who do not use email, please mail the article number(s) you would like to see addressed to Town Meeting Study and Improvement Committee, Town Hall, 52 Main Street, Milford, MA 01757. 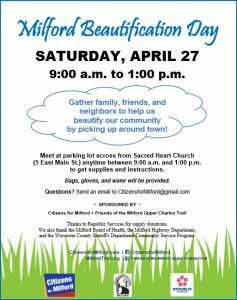 All Milford Residents and Groups Invited to Volunteer to Help Clean Our Community! 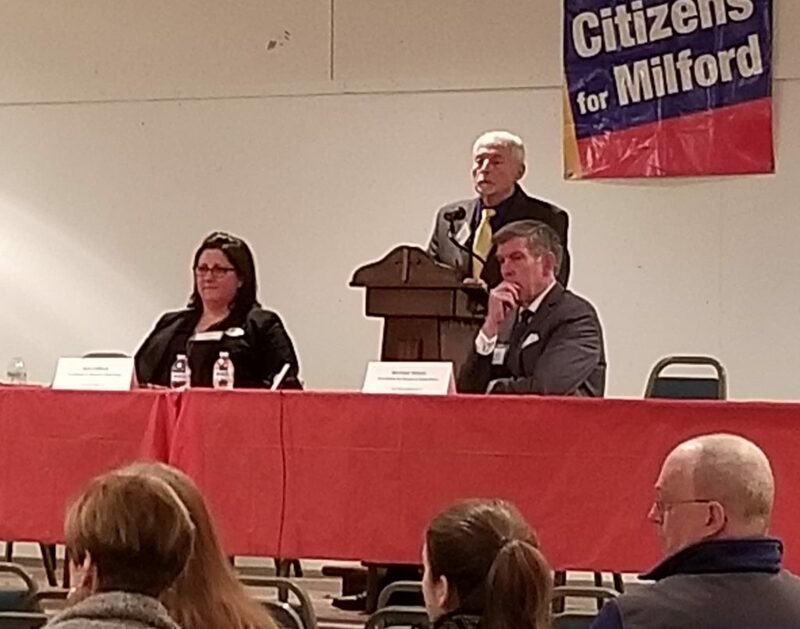 Citizens for Milford would like to thank all of the candidates who participated in the Candidates Forum on March 14th, as well as all Milford residents who joined us! We would also like to thank the pros at Milford TV for video recording the event and St. Mary of the Assumption for allowing the use of your Parish Hall. Look for the video soon and you can hear from Constable candidate Robert Sheedy; Trustees of Vernon Grove candidates Kristen Gardner and Scott Vecchiolla; Library Board of Trustees candidates Stephanie Abisla, Margaret Myatt, and Scott Vecchiolla; School Committee candidates Justin Dulak, James Ligor, Tarik Miranda, RJ Sheedy, and MIchael Visconti; and Board of Selectmen candidates Ami Clifford and Mike Walsh. GOOD LUCK CANDIDATES during these final two weeks of the campaign! 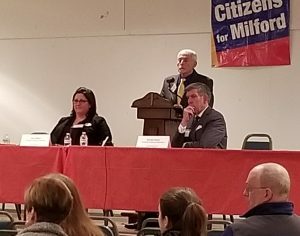 Citizens for Milford invites all Milford residents to attend its sixth annual Candidates Forum, which will feature candidates in Milford’s upcoming town election. The Candidates Forum will be held Thursday, March 14 in the Parish Hall of Saint Mary of the Assumption Church in Milford. Candidates will be available to meet voters starting at 6:30 p.m. The forum will start at 7:00 p.m. This event is free and open to the public. Each of the candidates in the five contested races will present a two-minute opening statement and then answer questions. Citizens for Milford will pose the first question then the moderators will invite members of the audience to ask questions of the candidates. 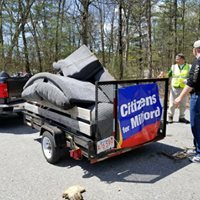 Recognizing the service of all our town candidates, Citizens for Milford has also invited all unopposed candidates to attend and to meet voters during the “meet and greet” time, from 6:30 p.m. to 7:00 p.m.
Citizens for Milford Chairman Steve Trettel and Vice Chairman Jose Costa will moderate the event. 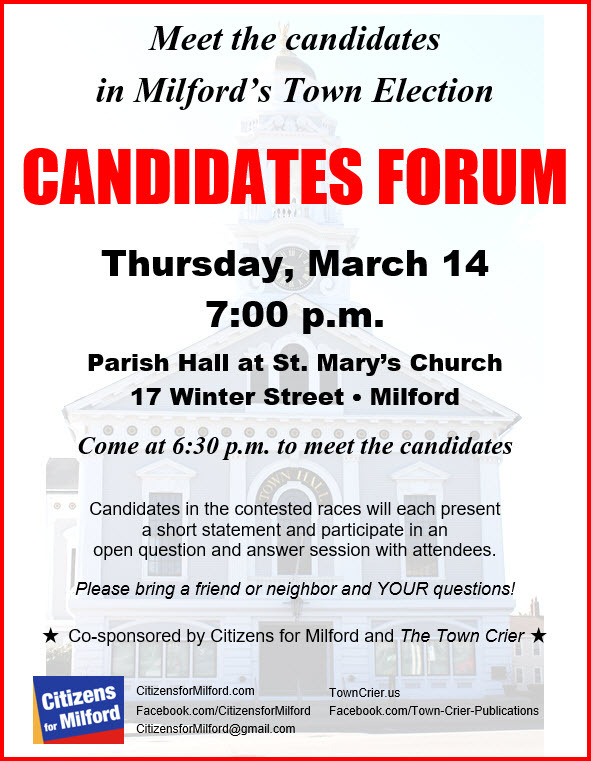 “The Candidates Forum provides an ideal opportunity for Milford residents to meet the candidates who are asking for our votes on April 2. We urge all Milford voters to join us and to ask their own questions regarding their own issues of concern,” stated Steve Trettel. Milford voters who are unable to attend the forum are encouraged to email questions in advance to CitizensforMilford@gmail.com. The group will make every effort to ensure those questions are posed to the candidates the night of the forum. 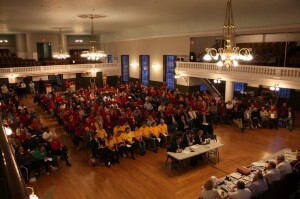 Milford TV will video record the forum and broadcast it in the days leading up to the election on April 2. Citizens for Milford will also provide a link to the video on its website as soon as it is available. The Town Crier newspaper is once again Citizens for Milford’s media partner for the Candidates Forum. “As Milford’s local newspaper, delivered to all homes and businesses in town, The Town Crier strongly believes in encouraging citizen participation in Milford’s town government,” said Publisher Alfred Holman. 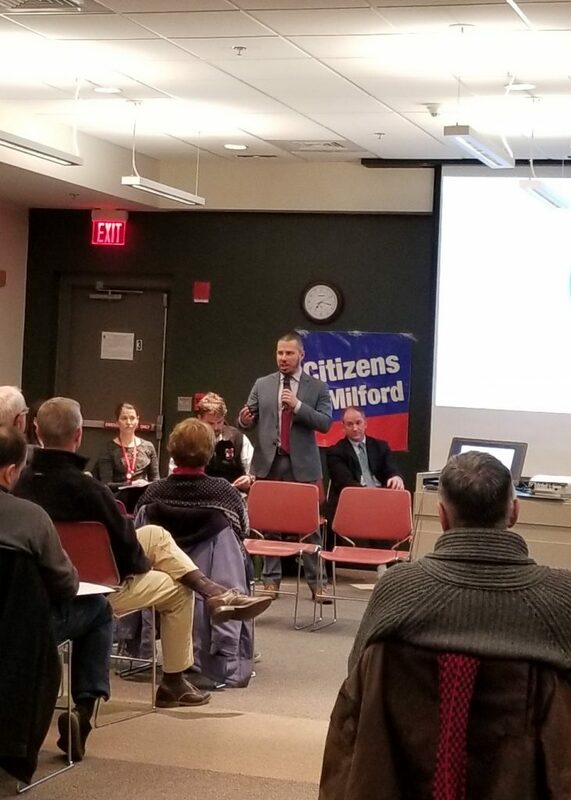 Citizens for Milford invites all residents to attend our first public meeting of the new year on Wednesday, January 16 at 7:00 p.m. in the Milford Town Library. 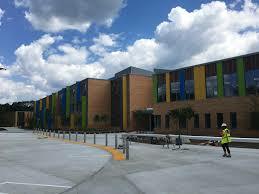 Members of the Milford Public Schools administration will be our special guests. Superintendent Kevin McIntyre; Assistant Superintendent of Curriculum, Instruction, and Assessment Craig Consigli; English Learner Program Director Jennifer Noorjanian; and Special Education Director Lucy Jenkins will present information regarding the school department structure, operations, new initiatives, the English Learner and Special Education programs, and current challenges. Following their presentation, Citizens for Milford Chairman Steve Trettel and Vice Chairman Jose Costa will invite attendees to ask questions of the administrators. “A key component of Citizens for Milford’s mission is to host casual public meetings that provide direct access to our public officials. Because the success of our schools is critical to all members of our community, we invite all residents to join us on January 16th to meet our school administrators and ask questions of importance to you,” says Chairman Steve Trettel. The Milford Town Library is located at 80 Spruce Street. The meeting will be held in the library’s Granite and Quarry rooms on the lower level. Limited parking is available at the library. Additional parking is available on Spruce Street and at nearby Stacy Middle School. 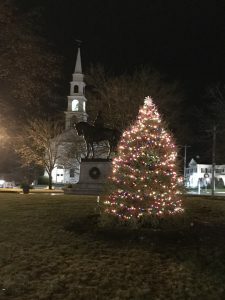 Citizens for Milford hosted the FOURTH ANNUAL MILFORD CHRISTMAS TREE LIGHTING on Friday, November 30, 2018. Highlights of this year’s event included the holiday carol sing-along led by members of the Greater Milford Community Chorus, as well as a special visit from Santa Claus. We extend our sincerest appreciation to every individual, group, and business who helped make the 2018 Milford Christmas Tree and the Lighting Ceremony possible. Thank you Parks Department, as well as Milford resident and owner of Busy Bee Landscaping Mr. David Sanches who donated and planted a beautiful new tree that we hope will serve as a symbol of peace and goodwill to Milford citizens for generations to come. We also express heartfelt thanks to Milford Commandery No. 11 stationed at Montgomery Lodge for funding the holiday lighting and decorations, the Greater Milford Community Chorus for leading us all in holiday carols, Red Heat Tavern of Milford for providing hot cocoa and soup, and Milford Public Schools Food Service for donating fresh-baked cookies. Your generosity and collaboration enabled us to provide the best possible community event this year. The Milford Christmas Tree will be lit each night throughout the holiday season. If you missed the ceremony last night, be sure to stop by Draper Park one evening to take in its glow. It’s a beautiful spot for family photos. Merry Christmas and Happy Holidays to everyone!